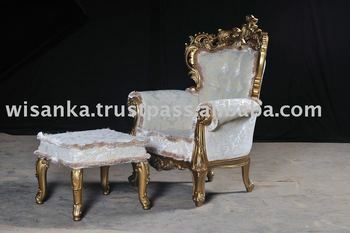 Gold Gilded Classic Arm Chair and Stool for your living room. The History of wood carving has from the remotest ages the decoration of wood as a foremost art. The tendency of human nature has always been to ornament every article in use. The North American Indian carves his wooden fish-hook or his pipe stem just as the Polynesian works patterns on his paddle. The native of Guyana decorates his cavassa grater with a well-conceived scheme of incised scrolls, while the native of Loango Bay distorts his spoon with a design of perhaps figures standing up in full relief carrying a hammock.